"The help that was previously from both the paralegal and the attorney, Ronna Woodruff was both enjoyable and helpful. My mind was placed at ease." "I decided to file bankruptcy because I had too much debt that I couldn’t pay back after cut backs in positions and mine was one of them. I chose Clark & Washington because you all were recommended by CCCS and then I saw one of the TV Advertisements and you all seemed like a good reputable company. The experience with the paralegal went very well. Not a lot of talk just straight to the point. The attorney was very nice and professional. Clark & Washington additional services were quick and nice. The process seemed unreal; it went so smooth. After leaving the office that day I felt relieved and I didn’t feel guilty about a situation I had no control over any more. Yes I would refer others to Clark & Washington, I really would. Thank you all so much for making a hard decision easy and for being the professionals you all are." "With sincere gratitude and kindness you all handled my Chapter 7 case with such professional expertise that I am proud to call you my attorneys and refer you to others. Thank you so much and may God bless you all!" "I would like to express my appreciation for the services I received from Clark & Washington and their employees. It was very painful to realize that I was at a point financially where bankruptcy was inevitable. Thanks for the patience, understanding and support of your staff I was able to complete the process as easily as possible. The installment plan for your company’s fees was a tremendous help. 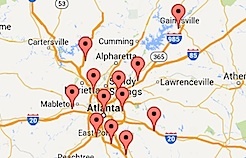 I saw your company’s Ad in the yellow pages and am glad that I chose Clark & Washington, PC. Anytime I called with questions or concerns the staff was always very patient and helpful. It was a pleasure meeting Mr.Washington and his personality eased my mind going over my personal situations. It has been a pleasure during a difficult time doing business with you company." "I had a co-worker recommend another attorney to take care of my bankruptcy. My co-worker stated she was cheaper than all the rest. I chose to go with a recognized name to insure a successful transaction. My co-worker is still receiving bills and threatening letters after his bankruptcy has already been discharged. My case is being handled smoothly and professionally. The moral of the story is that you get what you pay for. 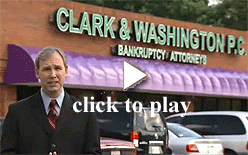 I would recommend Clark & Washington to anyone seeking help with bankruptcy." "My wife and I learned about Clark & Washington through a family friend. We decided to use their firm and have been very pleased with their work. The lawyers and staff have been very professional, but also very understanding. They have kept us up to date on all procedures and court dates. When we needed to meet with them our appointment was made in a timely manner. When we needed to talk to someone they were very informative and all out concerns were put to rest. Jennifer, one of the associates, has always been very prompt in returning our calls, and answered all our questions or had one of the attorneys return our call. My wife and I would highly recommend the firm of Clark & Washington to any of our family or friends." "The great service that Clark & Washington provide is that they have many offices to make it convenient for customers’ schedules. I have an attorney available to me at all times while going through this difficult transition in my life. They update all of your conversations in the computer so whenever you go back they know exactly what needed to be followed up on and what the last conversation was about. I was especially impressed with Kelsea Laun. I felt 100% better after I saw her and I was seen the same day I requested the appointment." "My first encounter was professional, warm and courteous. The entire process was done in layman’s terms and they made everything very easy for me to understand. The staff did a marvelous job taking the stress out of my situation. I was very impressed by their knowledge but also their understanding as they took the time to answer each and every question thoroughly. I was very impressed by their office and how quickly I was seen. I would recommend them to anybody." "The tragedy of September 11, 2001 not only distresses the whole country, but also hurt so many people who have been self employed like myself. I lost my business which was Export & Import of Persian hand woven rugs due to economical hardship & including my business so many enterprises faltered in the aftermath of September 11 catastrophe in the United States. I was alone with so much debt on my shoulder as burden and depressed moral, but a profound. Hope, grace in almighty God and a good friend like Emory Clark and Clark & Washington empower me to face and fight with those disorders and ordeals. Clark & Washington and its skillful staff helped to ever come all crises and once again stand on my feet. Now it has been almost 10 years passed from those gloomy days however, the sweet taste of great bonding with this law firm dilutes a bitter taste of financial crises. Finally, Clark & Washington in general and its friendly staff are two icons in my life that support me to resist against my economical hardship in the past and for sure they will remain as a beacon in my future." "My husband and I filed for bankruptcy late last year. I called to make an appointment with someone from Clark & Washington. The customer service representative was nice and made the appointment convenient for both of us. When we went in, our waiting was short. Everything went smoothly with the lawyer Ms. Rodriguez. She explained how the choice that we make would affect us, whether it was chapter 7 or 13 and which one would be more beneficial (Chapter 7). The paralegal assisted us well in filling out our paper work. We paid the filing fee up front and made payment arrangements for the attorney fees. This was very helpful. Other law offices want their money up front. Throughout the process we were represented well and our case was discharged quickly (within 4 months). Thanks." "We are pleased with the response and ability of Clark & Washington to provide us flexible legal solutions, and real help in our case. We appreciate their concern and attention to detail. The lawyers and paralegals are very professional, courteous, and knowledgeable and left me with a sense of confidence when leaving the office. I would recommend them to anyone in need of quality representation in bankruptcy." "I was very satisfied with my experience. The attorneys explained everything in a fast and efficient fashion. I feel that the overall value of knowledge that was provided to me helped me mentally and financially." "Having just received my discharge, I just wanted to say 'thank you.' Bankruptcy was not the route I wanted to take, but after losing my job, I realize it was going to be tremendously hard to make ends meet. I had contacted a few Bankruptcy lawyers, but I was not happy with the service and so, I was recommended to Clarke and Washington by a friend who had used your services before. I must say, the experiences I have received from the Attorney and paralegal was awesome. I thought, even though I was going through one of the hardest times in my life, I would be treated differently, but not so. Your client service department treated me with respect and anytime I called or had questions about my case, there was always someone to assist you in anyway possible and even go the extra mile to make sure that everything is explained in details before you hang up the phone. It was also great to know that you accepted installment fees and this was so helpful to me being on a tight budget. If anyone decides to take this route, remember, you will go in with the world on your shoulder, but you will come out knowing that burden has been lifted because the Attorney and paralegal will let you know if it was or was not the right thing for you. I would recommend anyone (which I already have) to Clarke and Washington because of their professionalism and the time and effort they put into each client. Thank you." "Dear Clark & Washington, PC Family, I thank you for your help in everything you all have done and continue to help me. May God bless all of you. Thank you again."